According to legend, Scott emerged from a potato field and immediately started digging spuds. According to reality, he was a science teacher before deciding he wanted to be a farmer when he grew up. Now he spends his days running the farm, tending to the fields, and working with local businesses to create a farm to table economy in Clatsop County. 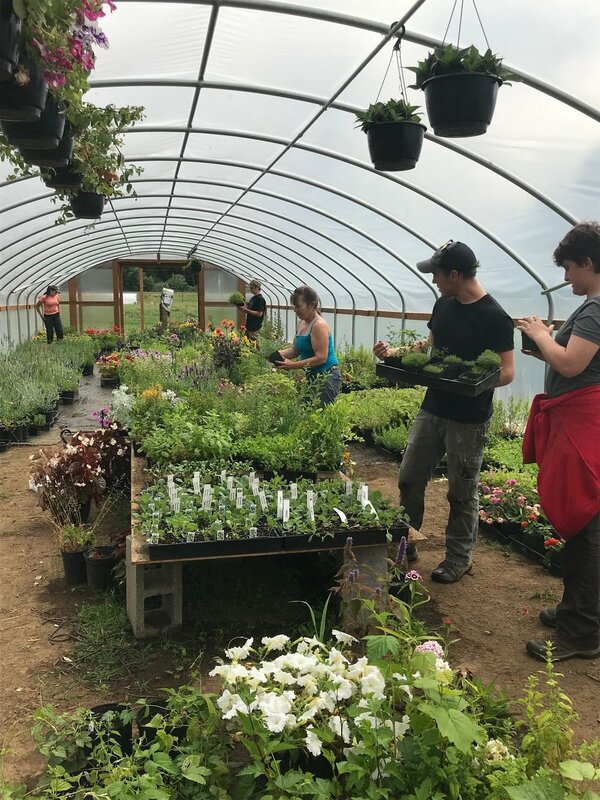 As the artistic spirit for the farm Bonnie is often absorbed with the flowers and putting together beautiful arrangements for markets and special events. She also makes a wide assortment of canned goods and strives to keep the rest of the team focused. Andrew is managing our growing nursery business. With over 700 varieties of plants this year, his organizational skills are being put to the test. After offering to spending a year helping his parents “start a farm”, he is now finds himself reading books on plant propagation, becoming an expert in the vast world of horticulture, and building hanging baskets while the snow comes down. All this in addition to helping with all the other farm work. Ever want to talk to someone about the reasons why you need 11 different varieties of mint… just give him a call. Claus is a Great Pyrenees and loyal protector of all of Blackberry Bog Farm's animals. Not only is he a fierce warrior fighting back the evils of the world, he also loves a good belly rub. Ginny is a Great Pyrenees/Maremma Sheepdog cross and is the newest member of the farm. She is learning quickly and will surely be a wonderful guardian. Ginny loves a good mud bath and is kind enough to share her mess with everyone. Gander is neither a fierce warrior nor a particularly good guardian, but he is a wonderful companion and the socialite of the whole operation here at the farm. If you come to visit make sure to say hello to our handsome Labrador. After several months working on the farm and remodeling the houses, Austin decided farm life was pretty hard and fled to the big city. After a while he felt sort of bad for abandoning everyone, so he made the team a website.